This was a good week. I went to Sense and Sensibility with my mom and best friend - and we loved it. It was the Kate Hamill adaptation so Elinor was a bit more lively than I'm used to. But it was a fantastic production and I'm so glad I got to go. If I had the money, I'd do it again this week! But, alas! Today I was planning on going to a corn maze with my boyfriend and nephew but it seems that plan is out (it's supposed to rain). So it'll be a lazy day for me. I have fantastic news. I was beginning to think that Nonfiction November wasn't going to happen this year, but Katie at Doing Dewey set it up last minute. For more information, check out her post. 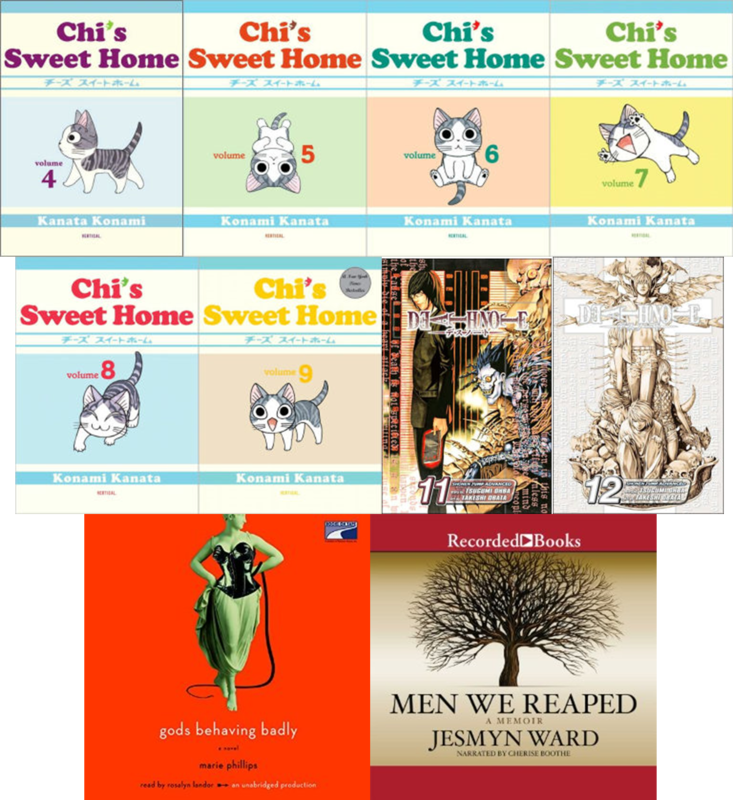 This week I finished volumes 4-9 of Chi's Sweet Home by Kanata Konami, the last two volumes (11-12) of Death Note by Tsugumi Ohba, Gods Behaving Badly by Marie Phillips, and Men We Reaped by Jesmyn Ward. I set aside Kugel's How to Read the Bible in favor of The Righteous Mind by Jonathan Haidt, which I'm going to try to finish by the end of November (no bad feelings if I can't). Haidt's book is about the psychological and moral reasons behind the polarization of America. 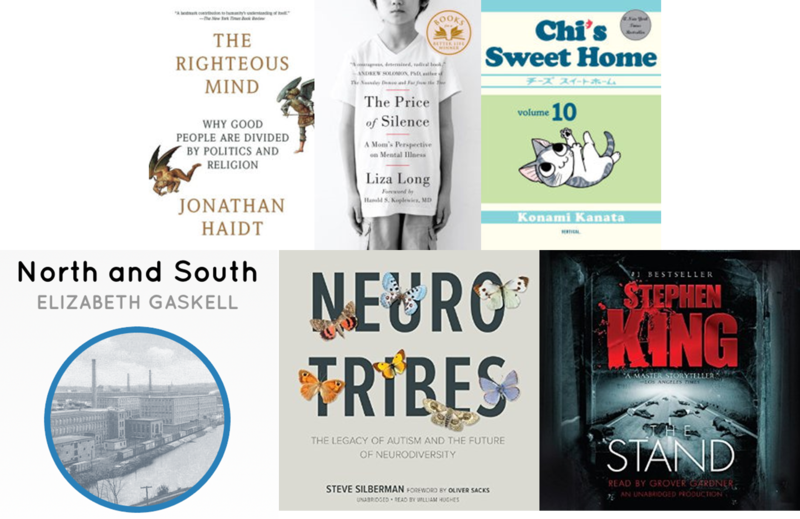 I'm also reading The Price of Silence by Liza Long, which is about the state of the mental health system in America, and Neurotribes by Steve Silberman, which is about the history and present of Autism. (I thought I'd had a nice variety for Nonfiction November, but upon typing this up all three are about psychology and social awareness. Sigh.) Neurotribes is a November readalong over at Doing Dewey. You're welcome to join in. My real life book club choice is The Stand by Stephen King, and my serial read is North and South by Elizabeth Gaskell. Yeah, should be a lot of fun! There are pay phones still around here and there. Whenever I see one I think about how times have changes. I think I actually used one in the past few years. It is interesting that you are reading The Stand. It has been so long since I read that. Yet passages and images from that book still seem to be vivid in my mind. I guess that says something about it. I never read The Stand. It's one of those books that I tried out as a teen and felt it was too adult for me (adult content, that is). I was reading adult classics at the time, but they're much more clean. :) Hopefully I like it as much as I liked the miniseries when I was a kid. I'm a huge nonfiction reader and I've never participated in Nonfiction November. I think I will try. Thanks for sharing it. The Stand is my favorite Stephen King. I'll be interested in hearing what you think.